The Arizona Association of Nurse Anesthetists’ greatest strength comes from our exceptionally devoted network of members and associate members. Thank you all. As our member numbers continue to grow within our state, we continue working to eliminate barriers and create opportunities for your practice. Within this update, I would like to share with you some of our latest news and information. The AZANA will once again be joining our nursing colleagues with the Arizona Nurses Association (AzNA) for RN Day at the Capitol 2019. We will be joining fellow APRNs and RNs from around the state to advocate for our profession. Registration is required to attend, and spots are limited. You may also consider an AzNA membership for discounted member rates. Online registration is available until 1/11/2019. We cannot stress enough the importance of maintaining AZANA’s presence at the Capitol and continuing to build upon key relationships with our legislators. YourCRNAs of AZ PAC is instrumental in keeping Arizona a place where CRNAs continue to have opportunity. 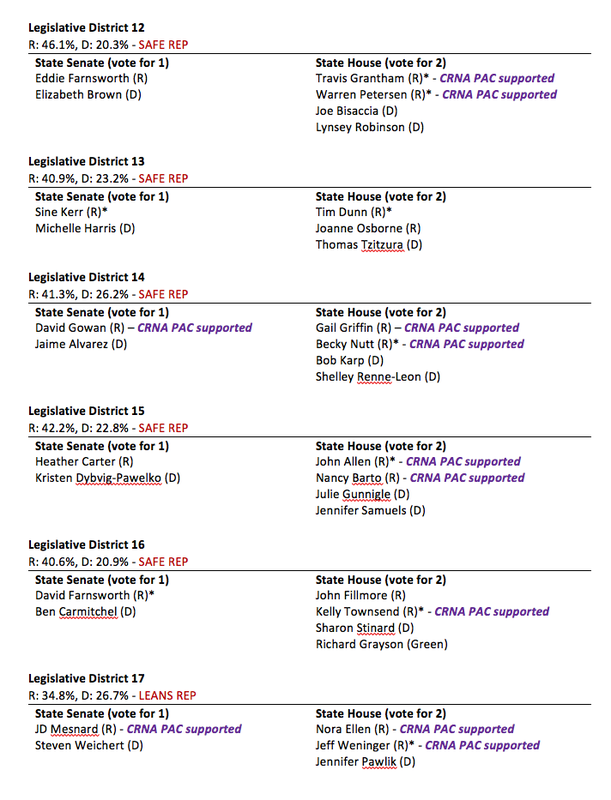 Our PAC strength as a foundation of our advocacy is only possible with your continued support. Please consider becoming a CRNAs of AZ PAC recurring contributor. This can be easily done in about 60 seconds, just follow the link below! The AZANA is proud to have expanded our CE offerings with a successful inaugural Sun & Sedona 2018 Conference this last November. We look forward to continuing this additional in-state anesthesia conference that functions not only to educate our members but to support our profession in Arizona. We would love to see you at our upcoming Sun & Fun 2019 Conference March 14-17th, 2019 atThe Scottsdale Resort at McCormick Ranch. In response to member requests, the AANA has introduced two new methods by which members can pay annual dues. You now have the option to make quarterly membership dues payments using the AANA website (with a credit card). In addition, you may pay dues for multiple years at one time. The AANA has also instituted a temporary waiver of the dues payment late fee ($25) as part of AANA’s win-back campaign to renew lapsed (dropped) memberships. CRNAs with lapsed memberships may renew without paying the late fee from December 1st, 2018 to February 28th, 2019. 36% ($232.50) of your AANA dues come straight back to your AZANA, and are a vital component to our existence! 36% ($232.50) of your AANA dues come straight back to your AZANA, and are a vital component to our existence! 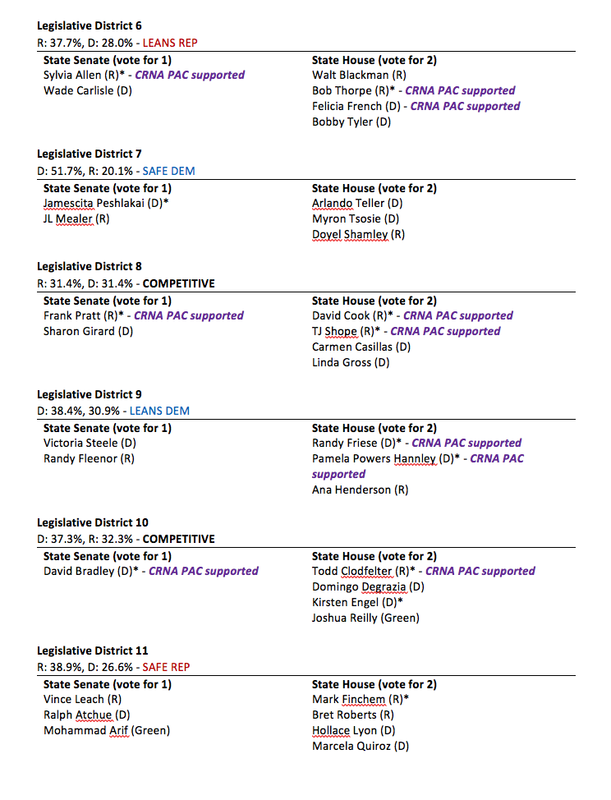 In addition to supporting your state association, key member benefits include the following: a full-time staff of state legislative experts, 6 free CEs, CE tracking, free consultations with expert staff on practice issues, research initiatives, business matters, AANA publications, and the ability to vote, hold office, and serve on committees. More information on benefits can be found online, simply follow the link below. Many Arizona CRNAs can have their association membership dues reimbursed by their employers. For the rest of us who do not have such employee benefits, they can be written off in most circumstances (consult your tax expert for details). Please encourage your colleagues who are not members to consider taking advantage of this late fee waiver and supporting the only association looking out specifically for our profession in the great state of Arizona. The AZANA Wellness Committee presents: Party on a Bike, January 19th, 2019 at 12 noon at The Madison Tempe. Come kick off your New Year and CRNA Week 2019 with this high-energy indoor cycling class! This event is FREE for AZANA members and their guests. Shoe rental and water will be provided. RSVP on Facebook -or- via email at info@azcrna.com. We hope to see you there! On behalf of your AZANA Board of Directors, we would like to wish you Happy Holidays and a Happy New Year! 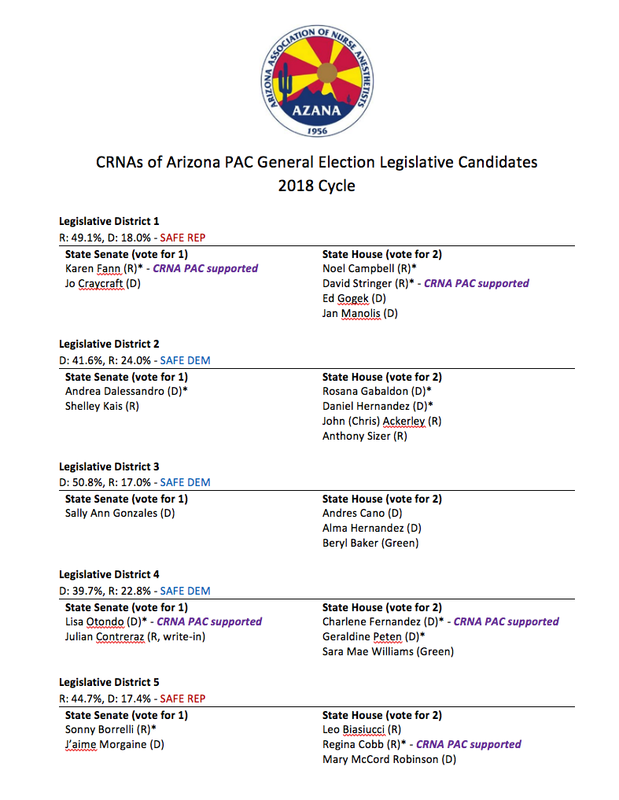 Each year, the CRNAs of AZ PAC contributes to a number of different legislators throughout the state who have demonstrated support of the CRNA profession. AZANA is pleased to present this information to members. Click here to find your legislative district. The AZANA recognizes the importance of protecting our profession and securing its future. There is a constant presence, pressing to restrict CRNAs into roles that limit full practice capabilities. With this in mind, we have formed a special task force to monitor and educate key stake holders regarding Anesthesiologist Assistants (AAs). We are fortunate to have a specialist in the field, Mike MacKinnon, CRNA, to lead this endeavor. Mike currently serves on the AANA AA task force and has years of experience consulting with multiple states assisting with education and preparation related to AAs. Additionally, the AZANA board representative to this task force will be our 2018-2019 President-Elect Lee Ranalli, CRNA. Now is the time to renew and maintain memberships. Furthermore, it has never been so vital that our members recognize the importance of contributing to the CRNAs of AZ PAC. Currently, we have over 120 recurring contributors of at least $25/month. These PAC dollars help ensure that we have a seat at the table when AA issues arise. This elephant in the room is no longer an “if” but a “when”. Whether you practice independently or within an ACT, the issues of AAs will ultimately impact all. Please maintain your membership, renew if necessary, and strongly consider becoming a recurring contributor to the CRNAs of AZ PAC. The AZANA is excited to announce that the ability for CRNAs in the state of Arizona to obtain their Drug Enforcement Administration (DEA) individual registration has officially been restored. It has been an uphill battle over the past six years, and this a huge win for Arizona CRNAs. This was an even more momentous task in that once something like this is interpreted from existing statute, it is significantly more difficult to reverse. So how was it done? The AZANA updated and clarified the law. Like many subjects on a federal level, the remedy isn’t always straightforward. Since the early 1940’s CRNAs have administered anesthesia in Arizona based on laws in the Nurse Practice Act (A.R.S. § 32-1661). In 1999, the Arizona State Board of Nursing (BON) adopted rules to formalize the prescription drug ordering process for CRNAs. These scope of practice rules would remain in place until 2012 at which point they were moved from rule to statute. This move to statute was tasked following a routine audit in 2011 by the Arizona Auditor General who at the time questioned certain provisions of these rules, which included granting prescriptive authority to CRNAs to write prescriptions and for patients to have them filled at pharmacies. The difference between the use of the “prescribing” language and authority for medications to be administered preoperatively, postoperatively, or as part of a procedure by “ordering” CRNAs created confusion and needed clarification. To clarify the difference between the practice of a CRNA and other advanced practice nurses who write prescription, the final consensus language provided that CRNAs could “order medication” instead of have “prescriptive authority,” and made its way into statute with SB1362 in 2012. Prescriptive authority and federal law can get convoluted and vary greatly from state to state. What may be good for one state may not be good for another. In DEA regulations, “the term prescription means an order for medication which is dispensed to or for an ultimate user but does not include an order for medication which is dispensed for immediate administration to the ultimate user.”1 This definition of prescription is part of the basis for the DEA interpreting federal law for CRNAs. The “traditional” practice of nurse anesthetists – ordering and directly administering controlled substances and other drugs preoperatively, intraoperatively, and postoperatively – does not constitute “prescribing” under federal law. Following SB1362, the DEA interpreted the new language to mean that CRNAs did not have prescriptive authority and sent letters to the twelve Arizona CRNAs that had active DEA numbers, asking them to surrender the number or have it formally revoked. This unintended revocation left Arizona as one of the few states where CRNAs were unable to obtain DEA individual registration and left the providers required to have them looking for out of state solutions. While small in number, Arizona CRNAs required DEA numbers at various practices such as Indian Health Service and Veterans Health Administration Hospitals. In the 2017 legislative session, the AZANA was able to pass SB1336, which (amongst other things) restored prescriptive authority language. Soon after SB1336 was passed, both the AZ State BON and the AZANA contacted the DEA again, requesting they resume issuing DEA numbers to CRNAs in Arizona. In May of 2018, after a full year of pressure that included a letter from Senator Jeff Flake’s office, the DEA notified the AZ State BON that they would, in fact, begin issuing DEA numbers to CRNAs. With the new passage of SB1336, the AZANA clarified that CRNAs have prescribing authority, but that it does not include the ability to write or issue a prescription for medications to be filled by a patient. This was not an expansion of scope, but essentially restored CRNA’s ability to obtain DEA numbers so that they are able to practice in settings where they are required, as was the case prior to the 2012 change. This win was very much a team effort brought forth by the AZANA in conjunction with the AZ State BON. These efforts highlight the importance of maintaining these good working relationships. With remarkable persistence the AZANA was able to get difficult legislation passed without having to make unacceptable compromises (which is not always the case in many states with this type of legislative push). Restoring prescriptive authority language that allows for DEA numbers has specific advantages that affect all Arizona CRNAs. First, it allows CRNAs to practice where individual DEA numbers are required. Other important advantages include greater autonomy and professional independence capacity (improved leadership qualification and ability to order necessary supplies, etc. ), reduction of perceived surgeon liability fears (even though no liability was verified in statute with SB1336)3, helping resolve questions/issues related to cosignatures, and enhancing opportunities in pain management. Healthcare is continually shifting under our feet and opportunities for independent CRNA practice in Arizona continue to grow. With every increasing capacity and advantage putting CRNAs on a level playing field with other healthcare providers, the better we are all served. Notable thanks goes to Senator Jeff Flake and his office staff, President Randy Quinn and all of the staff at the AZ State BON, as well as all the preceding and present AZANA Board of Directors and committee members for your persistence and hard work fighting to secure this win and restore DEA numbers for Arizona CRNAs. Also, thank you Arizona CRNAs for your continual AANA membership and PAC support that played an enormous role in facilitating this win. This continual membership backs the only association exclusively looking out for your profession, your AZANA. 1. DEA Code of Federal Regulations §1300.01 21 CFR Ch. II (4-1-12 Edition). Definitions relating to controlled substances. https://www.gpo.gov/fdsys/pkg/CFR-2012-title21-vol9/pdf/CFR-2012-title21-vol9-part1300.pdf. Accessed June 8, 2018. 2. Federal Summary. American Association of Nurse Anesthetists. https://www.aana.com/states/state-association-advocacy-resources/prescriptive-authority-tool-kit. Accessed June 8, 2018. 3. Arizona Revised Statutes § 32-1634.04. Certified registered nurse anesthetist; scope of practice; physician and surgeon immunity. Accessed June 8, 2018. https://www.azleg.gov/viewdocument/?docName=https://www.azleg.gov/ars/32/01634-04.htm. Accessed June 8, 2018. 4. Drug Enforcement Administration. Application for Registration Under Controlled Substances Act of 1970. https://apps.deadiversion.usdoj.gov/webforms/newAppLogin.do. Accessed June 8, 2018. In 2016-17, we decided to take on a great deal - and we were fortunate to have in place a humble, diverse leadership team, focused on delivering real results for our membership. AZANA is essential in ensuring our ability to take great care of people - and in that way, being involved in AZANA isn't some career-building activity, or just something extra - it's the right thing to do.